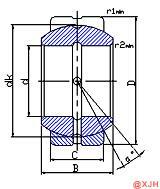 Spherical Plain Bearing GEG.ES Series is a self-aligning plain bearing designed for heavy loads. The inner and outer rings of these models use quenched, ground high carbon chromium bearing steel and phosphate surface treatment to provide high corrosion and wear resistance, followed by molybdenum disulfide (MoS 2 ) sintering. Spherical Plain Bearing GEG.ES Series can swing at any angle during motion. It adopts various special processes such as surface phosphating, blasting, inserting, spraying, etc. It has the characteristics of impact resistance, corrosion resistance, wear resistance, self-aligning and lubrication. It can withstand radial loads, axial loads or combined loads in both radial and axial directions. The surface has high gloss, good mute effect, high speed and long life. Spherical Plain Bearing GEG.ES Series is widely used in engineering hydraulic cylinders, forging machines, engineering machinery, automation equipment, automotive shock absorbers, water conservancy machinery and other industries.